As we had finally sunshine here in Germany we decided to have a day at another city. My task was to decide which city to visit and I quickly came up with Flensburg. I had been very often there over the years as a very good friend lived there and so I knew at least a bit about what places to check out. 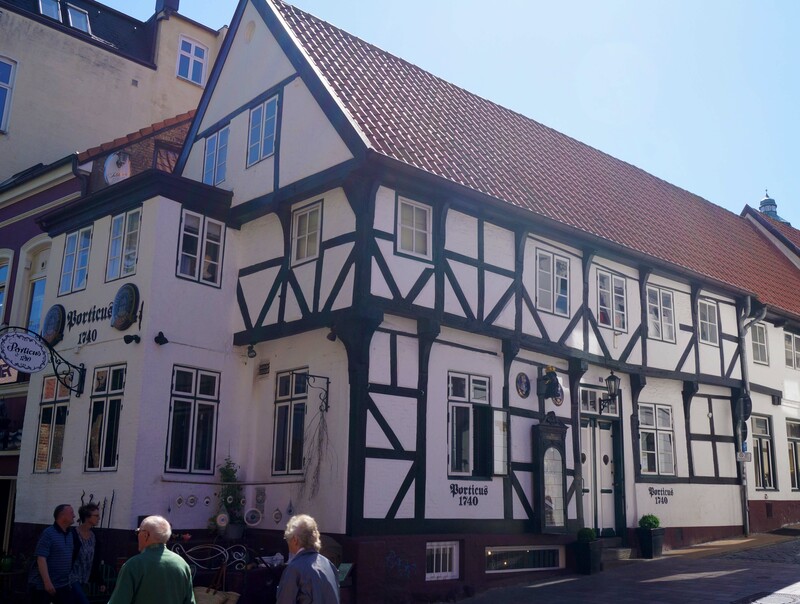 Flensburg is roughly one hour away by car from my hometown and is located just a few kilometers away from the Danish border. Initially we planned to have a short stop in Denmark but decided against it as there was just not enough time. After being stuffed to the brim we continued our trip through the city. The inner city (Altstadt) is very beautiful because there are so many old structures still standing unlike many other cities here. The reason for this is that Flensburg only suffered small damages during WWII through the bombings. For example my hometown has barely any old buildings left as most of the city was destroyed during the war. I must admit that my hometown looks like a grey ugly thing compared to this city but then again there is also a reason why my hometown has been voted before the ugliest city in this state but that is stuff for another time. Both my wife and my crazy Chinese mother-in-law were fascinated by the Old Town in which also the long shopping street is located. Not only it is full of historical buildings but it is also the place in the city with the most people due to the shopping area and has many sightseeing spots such as several churches, museums and other points of interest. What else makes this city so interesting? Well it used to be a major trading port after the collapse of the Hanse in the 16th century and thus many special things started such as the local Rum production. Here you can find a so-called Rum and Sugar Mile in which all Rum/ Alcohol and sugar production sites are listed and can be visited by eager tourists. We did not follow it but saw several shops selling Rum and the Hansens Brauerei were we had our lunch is also part of this Rum and Sugar Mile. 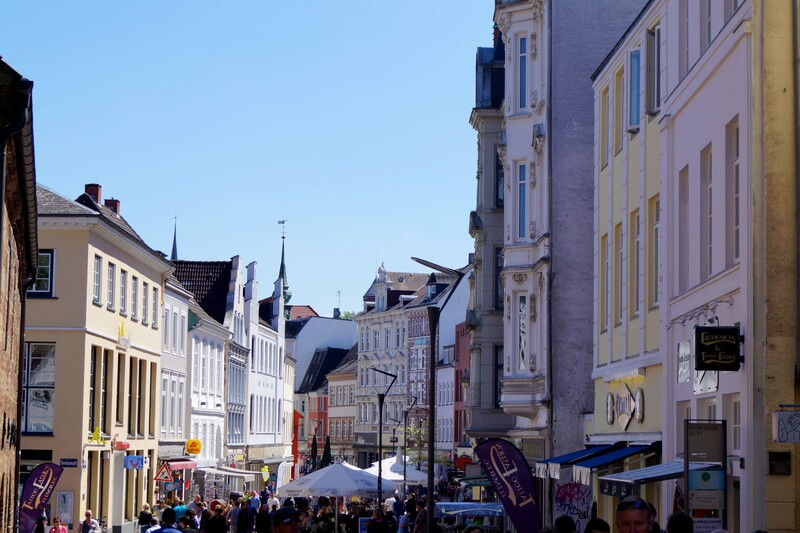 As we had only limited time due to us oversleeping in the morning we could only have a short tour through the Old Town including a short stop for some nice ice cream and then headed out to visit Glücksburg, the northernmost city in Germany. The only reason for going there was to visit the Glücksburg Castle which was built from 1582 to 1587. 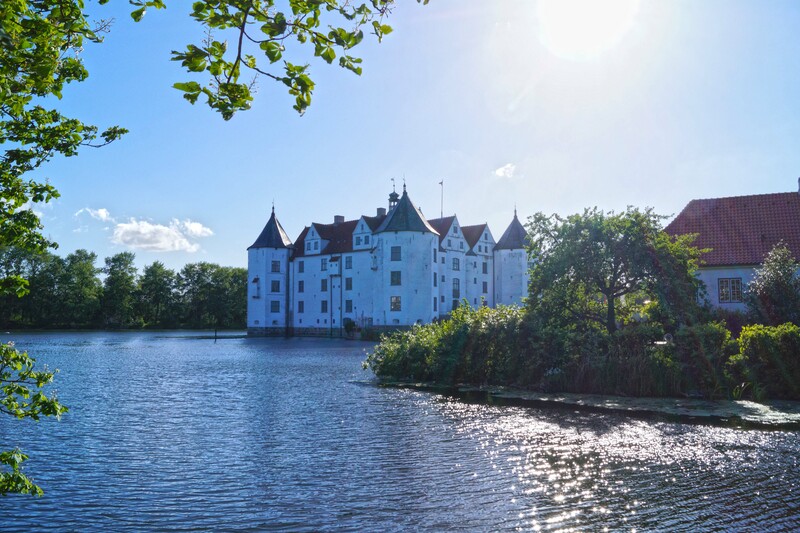 It is certainly not the most impressive castle in the world but I wanted to see it already for many years and this trip to Flensburg was the perfect opportunity as it is just few kilometres away from the city. The castle is nearly entirely surrounded by a huge pond which was created as a defence system back in the day. Sadly we could not enter as it was too late when we arrived and thus we started our tour back home after taking few pictures there. Have you ever visited a city and got the feeling that you want to move there? Have you ever visited any castle? Oversleeping on a weekend…sounds like a tired family. Yet still have the energy to go out in the end. I was thinking that MIL would be jumping around to wake all of you up. That ice-cream, though. What big portions and they look so good 😀 Very nice town you visited. The castle looks good from the outside, still very white after all these years. I think MIL has very close relations to monkey thats why she looks like that. Wow Europe is just so charming… I can’t wait to be back there!!!! What stunning architecture and delicious food! Nathan seems to having a great time touching the flowers. And he seems to be keeping grandma on her toes! Love the pic of her chasing after him! I love these kind of old architecture when it is being kept in good condition. *ugh* I really need a trip to a decent Brauhaus. It’s not that I don’t like fish, but the last three months have just seen a little too much of it. Oh I have visited so many cities and got the feeling that I would like to move there- Barcelona, Tokyo, Bangkok. And I always liked the idea of moving to Southern California- lucky because I’m moving there in 2 weeks! 🙂 Anyway, it looks lovely- glad you enjoyed it and the photos are lovely.